I remember how excited I was when Google Maps first came into existence. I would seize anyone who seemed to show a particle of interest, sit them down in front of my computer, and click madly on the little square until I could discern my own house. Well, Google Maps has grown up quite a bit since then. Now I can satisfy my need to stalk my own house by flying straight home on the wings of Google Earth. When that gets boring, I can zoom way out and give the earth a spin, as if it were an old-fashioned globe, or turn it upside down to check on Antarctica. 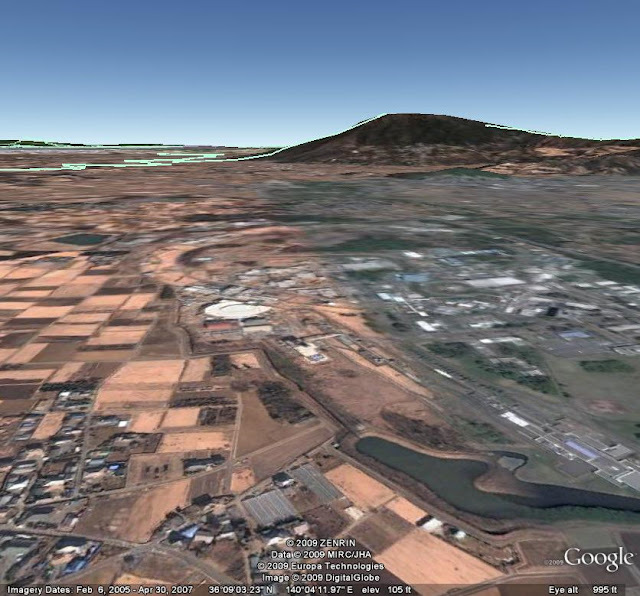 Google Earth is also a great way to tour big science in all its glory. How, you ask? Well, first download the program. Then make a list of your dream destinations —Fermilab, CERN, KEK in Japan, SLAC National Accelerator Laboratory—and fly to each one. SLAC National Accelerator Laboratory makes for a splendid aerial shot, even more impressive than the giant rings of Fermilab's Tevatron or the LHC. The two-mile-long linear accelerator ends in a fan of buildings that once housed enormous detectors that helped scientists probe inside the nucleus, among other things. The smaller ring you see is the Stanford Synchrotron Radiation Lightsource. You might notice that parts of the lab seem to be under construction— it seems like these images were taken when the lab was excavating for the Linac Coherent Light Source. This year the nearly half-century-old linac was reborn as the world's first hard x-ray free-electron laser. The SLAC linac from above. Electrons start their journey at the left end. 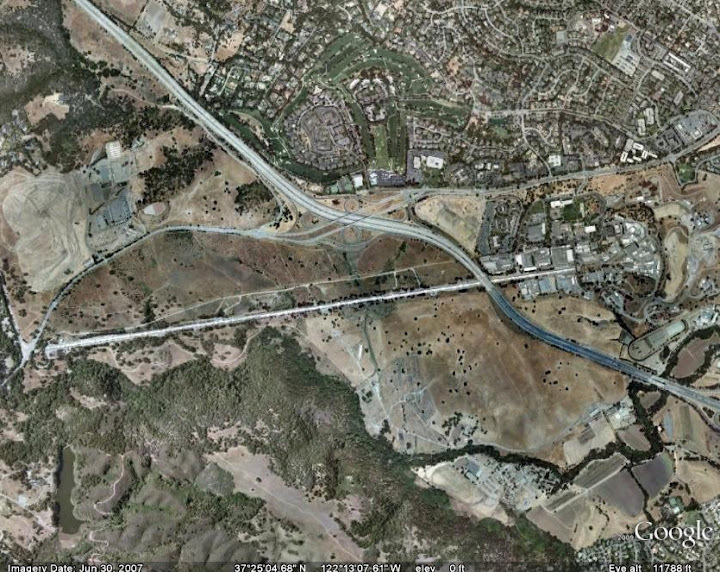 Conveniently, Interstate 280 spans the accelerator. 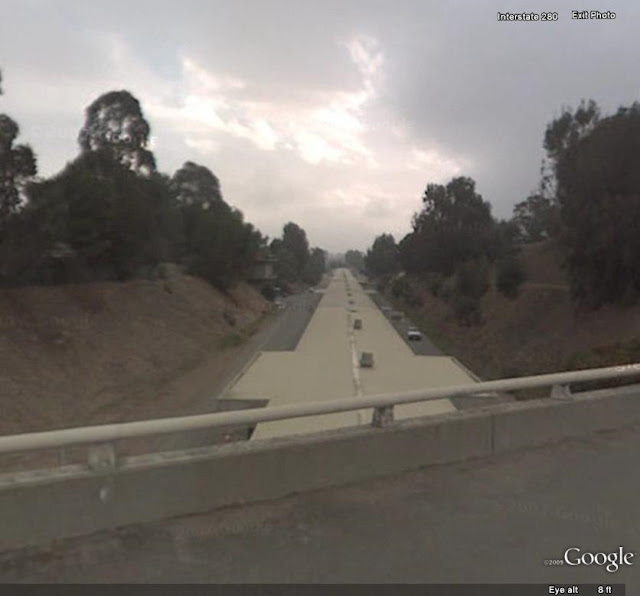 Use "street-view" to land on the freeway and look down at the accelerator's klystron gallery, the building that houses the accelerator's above-ground workhorses. The accelerator from the I-280 freeway. Next, wing it over to Fermilab. You'll see the patchwork of wetlands, woodlands, and grasslands that make up the 6,800-acre campus clearly marked by the distinctive white ring of the Tevatron, flanked by its booster ring. Are those fuzzy brown spots I'm seeing bison? They might be. Check the option for 3D buildings so you don't miss a pretty impressive 3D construction of the lab's famous Wilson Hall, with its curving walls and sentinel of international flags, a reminder of the cosmopolitan nature of particle physics. 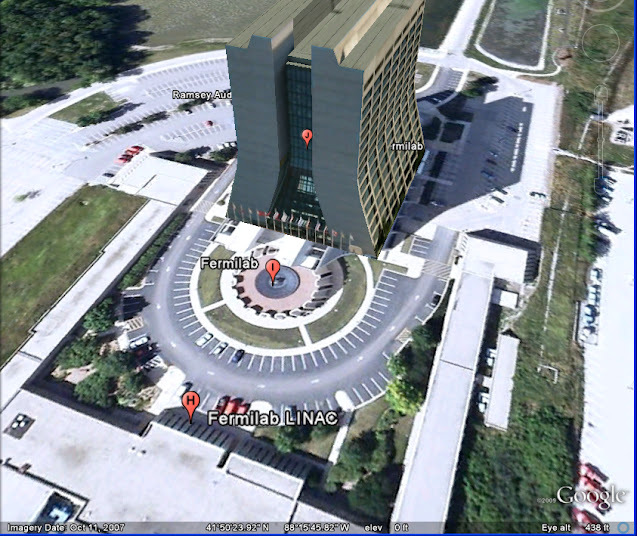 Wilson Hall at Fermilab, rendered in 3D. If the architecture inspires you, why not help Fermilab name their next accelerator? It's called Project X right now, but they're looking for something with a little less science fiction and a little more personality. The KEK-B electron-positron collider in Tsukuba, Japan. Brookhaven National Lab is also distinctive aerially—check out the the Relativistic Heavy-Ion Collider at latitude 40°52'36.42"N, longitude 72°52'19.09"W.
Fun post! In fact, I got a chance to visit (and write about) most of those places on a summer road trip. Fermilab really takes the architectural cake; but it's also cool to see SLAC from above. The Hadron Collider is somewhere on the French/Swiss border. It would be awesome to see a satellite view of that because it's 16.5 miles long! Fermilab does look awesome as an aerial shot.